How many things have you stopped yourself from doing something, simply because you did not believe enough in your ability to make it happen? How many big ideas have you reduced because it seemed way out of reach? Where would you be now if you had simply just begun back then when you first thought of it? And now you watch others doing the thing you thought about doing. How long will you let this be your story? But when will all this happen? When will tomorrow or ‘one day’ come? Your dreams are not happening because you are waiting, waiting, WAITING! It does not work that way, honey! You can wait and wait until the cows come home and if anything, your self-belief will GO DOWN! 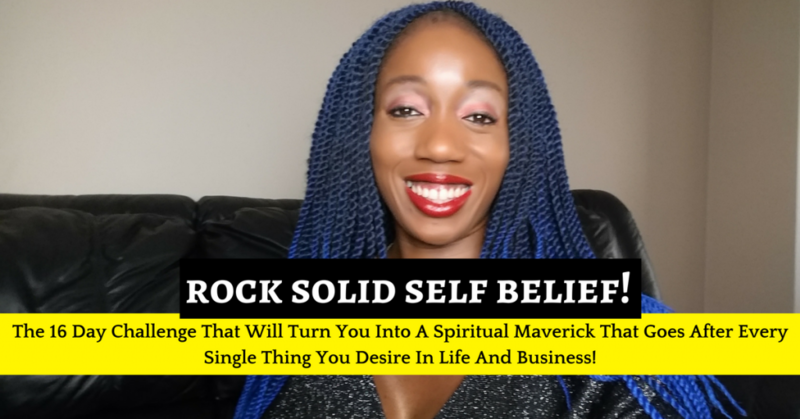 YOU CAN build that rock solid self belief – The kind that makes your big vision happen! You want to live in abundance, as well! And yet, you are holding back due to self-doubt! Done with toeing the party line and getting a version of success that does not fill you with glee…. When you KNOW you are called to something more but without the courage and the self-belief to step out and do your own thing, when will your real life truly begin? IT IS TIME TO BREAK FREE OF THAT MESS! It is time to rebuild and boost your self-belief so as to get you consistent and persistent in creating the big life you are born to live and want to live! The 16 Day Challenge That Will Turn You Into The Spiritual Maverick That Goes After Every Single Thing You Desire In Life And Business! Simply, 16 days with one simple action to take to build your self-confidence and self belief. Short lessons, in most cases, to get you thinking differently, reacting differently and developing the rock solid self belief that you need to get past any nonsense in your mind or even in your environment that holds you back from creating the life you want to live! The 5K In 10 Days Program – How You Can Make $5k Per Month In your Own Online Business By Following this Simple 10 Day Strategy I Used… Even If Starting From Scratch With No Website, No Mailing List, No Tech Skills! Tapping into intuition – how exactly to tap into the wisdom that is yours by birth so that you can take fast action to get what you desire out of life. Why and How To Break the religious, familial traditions that have kept you back – Being a maverick is not a bad thing, being too much is not a bad thing. time to start listening to those little nudges, rather than all those external voices telling you how to think and who to be. How can you create success, if you keep not trusting yourself? How to become your most charismatic self – your sexual energy will be touched on as well as much more to help you be the leader you know you have always been. What work must be done daily to get results – Keep creating abundance simple by following through on these simple actions consitently – Confidence will expand as you do these simple things. What habits to take on that will keep you being bold – Success is a habit – Learn the habits of highly successful and confident people who get what they want out of life. How to really get that you are enough – this feeling of insufficiency now needs to go and this will help you in seeing finally that who you are is EXACTLY who you need to be to deliberately design the life you desire. And just as a quick introduction, I am Rosemary Nonny Knight and I have been one who felt the fear and did it anyway… FINALLY! But finally found the self belief to fully go after my maverick-type dreams of impacting 334k people making £334k or more a month. Not there yet but I have fully replaced my full-time pharmacist income and much more each month, helped lots of others to create wealth online and all because I learnt to follow my intuitive nudges and believe in myself enough to go after everything I desire. Are you done yet with playing small and listening to the enemy within? Or are you willing to do what it takes to build that rock solid self belief and start getting everything that you desire? Click the button below if you choose to stop playing small, stop giving into the fear and doubts that assail you and instead become the spiritual maverick, the independent thinker that plays full out in life and in business to create the big vision for their life.